Five explosions were heard on Wednesday near the northwestern Damascus district of Muhajireen, close to the base of the Fourth Armored Division that is led by President Bashar al-Assad's brother Maher, residents said. It was not clear whether those forces were being targeted. Syria's information minister denied on state television that any explosion had occurred at the base. This as a "terrorist bomb" earlier exploded at Syria's national security building in Damascus during a meeting of ministers and security officials wounding several people, some of them critically, state television said. 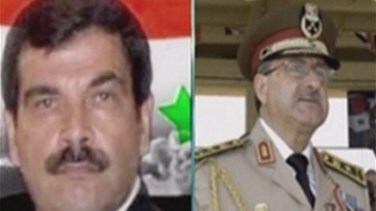 The Syrian Defense Minister Daoud Abdullah Rajha was killed in the blast while Syrian Interior Minister Mohammad Ibrahim al-Shaar was wounded. Syria later quickly assigned the Chief of Staff of the Syrian army, Fahd Jassem al-Freij as Minister of Defense. According to reports by the Syrian State Television via Reuters , Interior minster is alive, in “stable condition”, after Arab TV stations reported his death. Assef Shawkat, brother-in-law of President Bashar al-Assad, was killed in a bomb attack which targeted a meeting of Assad's top security and military officials on Wednesday, according to Syrian State TV. Shawkat died in a Damascus hospital where he was taken after the attack. Intelligence Chief Hisham Bekhtyar is undergoing surgery and is in critical condition. Later, sources claimed that the Syrian assistant Vice-President General Hasan Turkmani died of his wounds sustained in Damascus blast. "The suicide bomber worked as a bodyguard for President Assad’s inner circle", the Syrian security sources told Reuters. AFP sources said the bomber blew himself up in the conference room where the top officials were meeting. He had been wearing an explosive belt around his body. Liwa al-Islam, a Syrian rebel Islamist group, claimed responsibility for the explosion. Fresh reports said that the Free Syrian Army adopted the explosion which hit the National Security Building in Damascus. In this context, the commander of the SFA expressed fears that the regime may resort to chemical warfare to fight off opposition and civilians, some sources said. Activists in Damascus said by telephone that Republican Guards sealed of the Shami hospital in the capital after ambulances had brought casualties from the site of the explosion. For its part, the General Command of the Syrian Forces said that the “Terrorist bomb attack” is the work of “hired hands”, adding that it will pursue perpetrators and wipe out “criminal gangs”. Syria vowed to punish those responsible for a bomb attack which killed the defense minister and President Bashar al-Assad's brother-in-law, saying it would "chop any hand that harms national security". "The armed forces are determined to terminate the killing gangs and criminals and pursue them wherever they go," a military statement read out on state television said. "Whoever thinks that by targeting some commanders they can twist Syria's arm, is delusional". Later on throughout the day some news sources claimed that several Syrian soldiers were defecting in the wake of the explosion; something that the newly appointed Minister of Defense ruled out completely. For his part, Information Minister Omran Zoghbi said that incidents occurring in Syria are the final chapter of the American-Israeli conspiracy book, pointing fingers at international security services for plotting the attacks. Head of the Syrian National Council Abdul Basset Sieda described the Damascus bombing as a “turning point” in the conflict, adding that it will be over in a matter of weeks or months. Peace Envoy Kofi Annan condemned latest bloodshed in Syria, saying that violence only underscores urgency of decisive council.This after the International envoy had requested the delay amid differences between Moscow and the resolutions's Western sponsors over whether Damascus should be threatened with sanctions. Subsequently, the United Nations Security Council postponed until Thursday a vote on a Western-backed resolution that threatens Syrian authorities with sanctions in a bid to end the 16-month conflict, Russia's U.N. envoy said on Wednesday. "A possible vote has been postponed until tomorrow morning," Russian Ambassador Vitaly Churkin told reporters after a meeting of the envoys of the council's five permanent members, adding that further talks on the measure would be held on Wednesday. For its part, the U.S Treasury designated 29 senior Syrian officials and some companies linked to weapons proliferation under U.S. sanction. In turn, Washington said that it is clear that President Bashar Assad is losing control of Syria and the international community must work urgently toward political transition. US Defense chief says that he is very concerned by increasing violence in Syria and the world needs to increase pressure on Assad, adding that Syria appears to be “rapidly spinning out of control”. In turn, British Defense Secretary said that the situation in Syria is deteriorating and becoming more unpredictable. British Foreign Minister William Hague said the killing of top Syrian defense and security officials in a bomb attack on Wednesday showed there was a need for strong action by the United Nations to end the conflict. The attack on a security building in Damascus on Wednesday showed the need for an urgent political solution in Syria, French Foreign Minister Laurent Fabius said on Wednesday. "This act is of great importance," Fabius said ahead of an hearing in the upper house of parliament. "Given this degree of violence, it means that it is necessary and urgent to find a political transition that allows the Syrian people to have a government that expresses its aspirations." He said France would continue to push for this at the United Nations Security Council, which is due to vote on a resolution on Syria later on Wednesday. Meanwhile, Russia's Foreign Ministry said that pressing further sanctions against Syria now will show Western bias in favor of the opposition. The ministry added that taking sides in the Syrian conflict promotes the clashes to full scale civil war. Syrian army artillery shelled the Damascus district of Mezze and Mouadamiya suburb on Wednesday, in an escalation of attacks against areas where rebels operate, after a deadly blast that killed three top military officials, activists said. Artillery batteries stationed on Qasioun mountains overlooking Damascus started firing intermittently at the two districts at about 7:30 p.m.(1630 GMT), the activists said. It was earlier reported that dozens of Syrian rebels stormed alleged security post in Southern Damascus according to sources via Reuters. Overnight clashes in the Syrian capital continued until Wednesday dawn for the 4th consecutive day while the Syrian observatory reported that 24 people alongside 60 members of the Syrian forces were killed in Tuesday’s clashes. A Turkish official reported that two Syrian brigadier-generals were among some 600 Syrians who fled from Syria to Turkey overnight, bringing the number of Syrian generals sheltering in Turkey to 20, including a retired general. The official could not immediately confirm if other defected officers had also arrived in Turkey in the last 24 hours but said a number of lower-ranking soldiers usually accompanied defecting generals. The number of Syrian refugees in Turkey rose to 43,200 after 600 more arrived overnight, he said.